Argentina is a country that has plenty of marvels and activities that children would find enjoyable. 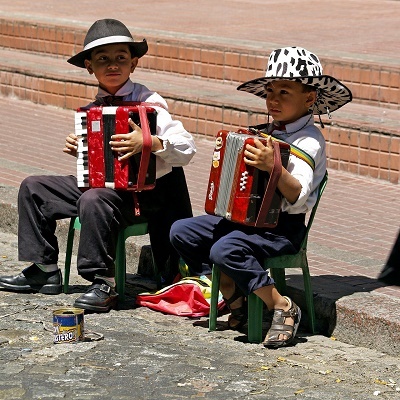 Argentina offers a wide variety of activities that kids of any age would look forward to engaging in. The Argentinean landscape alone provides for many recreational avenues. For instance, the shores of Buenos Aires are lined with untouched beaches and beach resorts. For the more adventurous, diving is an activity that can be experienced here. Those who prefer a laid-back day can enjoy beach-side entertainment like stage plays and other stage performances in resorts like Mar Del Plata. A family with younger kids can also enjoy the scenery and some fun bonding activities in the country's many parks. One of which is the Bosque de los Rosedales which has many interesting plant-lined paths to trod on. Riding bikes in the area is also a great idea. Another notable park to see is the Iguazú Falls National Park which showcases many of the country's marvelous natural wonders - from spectacular waterfalls to hundreds of species of birds and thousands of species of animals. Those who prefer a quiet but fun and educational day in the city can also check out Argentina's many historically rich museums or admire some of its astounding architectural sights. While the fun activities for kids are abundant in the city, parents would not have to fret about their children's education. Many international schools in Argentina offer high-quality education for expatriate children and offer them a chance to study in a multi-cultural environment. Numerous independent schools in Argentina (private schools) are also a popular option for expats in the country as they normally have better ability to provide bi-lingual education.